Toadsworth has invited Mario and all of his friends on a Mushroom Kingdom luxury cruise. When Bowser discovers he has not been invited, he vows revenge. Each player rolls a dice to move around the board, and when every player has taken their turn they are divided into teams to play minigames to earn Coins. Coins can be used to purchase Stars or items. The player with the most Stars at the end of all the turns is the winner. 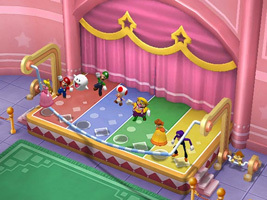 Mario Party 7 contains six new boards and 86 minigames, including several that use the GameCube microphone. Up to eight players can take part, sharing the controller. One of Donkey Kong's single player games is called "Jump, Man", where you have to race Donkey Kong to the top of a treehouse while jumping over barrels. The stage layout is based on the arcade Donkey Kong, and the name of the game is a reference to Mario's original name "Jumpman", before he was renamed for the American release of Donkey Kong.